This Is Your Captain Speaking: Do Pilot Unions Have a PR Problem? Last week, the pilots of Southwest Airlines took to the streets outside of the airline's headquarters in Dallas to protest the lack of progress in their current negotiations. The union is not on strike, or even close to it, but is engaged in what is known as "informational picketing" to get their message out. Southwest Airlines' management and the pilots' union have been in negotiations since the pilots' contract became amendable in August of 2012. If you'll recall, airlines are organized under the Railway Labor Act (RLA). Under the RLA, labor contracts never expire but become "amendable". Labor unions continue to work under the terms of the preceding contract until a new contract is negotiated. The pilots' union at Southwest (SWAPA) contends that the airline has been dragging its feet in negotiations in order to extend the favorable terms of the preceding contract negotiated in leaner times. This standoff has continued for several years while the airline has been recording record profits. 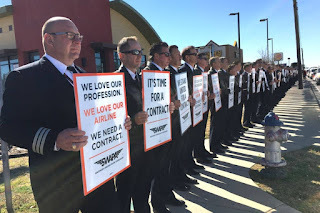 The airline, for its part, points out that a deal was reached with the union's negotiators last summer which included raises totalling 17.6% over the life of the contract. That deal was soundly voted down by the union membership. So who's in the right? Has the airline been using the RLA to delay paying raises to its pilots, or have the pilots just gotten greedy in turning down a great offer by the company? Well, as per usual, it depends on with whom you speak. Each side passionately insists that their version of events is the correct one and that the other side is obfuscating. And also, as per usual, there is an element of both truth and falsehood in each narrative. But my purpose here is not to adjudicate the differences between the two opposing sides, but rather to point out that pilot unions have a natural disadvantage when they attempt to take their case to the public though picketing and other public displays. The problem is that while many pilots in entry level jobs at commuter and cargo airlines do in fact make a very modest wage, by the time a pilot gets on board at a major airline, he or she is making decent coin. And on average, pilots at major airlines are solidly in the middle to upper middle class arena. This presents a PR problem when trying to garner a sympathetic ear from a public who may feel that the picketing pilots' income is likely higher than their own. Taking any dispute over wages and benefits to the public inevitably invites an inquiry into and a judgement of what pilots actually make. And of course, helpful members of the press and airline managements are only all too willing to facilitate the discussion by providing actual numbers for public consumption. High pay, job security and profit-sharing — and Southwest pilots are picketing? The article was somewhat misleading but not factually incorrect. But it is the pilots who have the burden of getting across their message that having no cost of living raises since 2012 is causing their real purchasing power to erode due to the effects of inflation. It's not an easy message to convey while trying to avoid the "greedy" label. Another difficulty is that many members of the public don't understand the nature of the pilot profession. For instance, public perception of a pilot's work week may be that pilots have a lot of time off. Some do, but many in the public may not realize that pilots can be gone for weeks at a time and miss many family events and holidays that someone in a traditional job would not. But as with compensation, taking their case to the public invites kitchen table discussions of what pilots should be paid and how much they should work. These discussions will probably not end up favoring pilot demands for higher wages. Lastly, many members of the public don't have a good understanding of unions and unionism in general. This is due to the fact that with only about six percent of the private work force being unionized today, very few Americans have any experience with unions. With the high water mark of union membership in the US having been reached back in the 1950s and on a steady decline ever since, unions may be thought of by the public as an anachronism in today's economy. I personally don't get too worked up about any of this. My feeling is that the underlying economics more or less determines wage rates. With an ongoing and worsening world wide pilot shortage in progress, wage rates will inevitably increase as the big four major US airlines have to compete to hire from a dwindling pool of prospective pilots to replace huge numbers of retiring Vietnam era pilots. And on the bright side, informational picketing allows some of the more enthusiastic members of the pilots' union to expend their energies organizing these outings. It seems to help reduce the discomfiture in some pilots which is being made worse by the length of the negotiations. And it actually looks like a lot of fun. Unfortunately, I'll be working. You say the economics determine wages for pilots. That has never been true in the nearly 50 years I've been involved in military and airline aviation. It simply can't be true, with at least a 6-8 year lag in pilot supply, and ten to twenty year cycle of huge hirings and huge layoffs. There have always been far more qualified pilots lining up to apply for jobs, than the airlines could hire. Until now. I would say it is the airline industry that has a PR problem, because young people no longer want to be pilots. The industry and press can spin this any way they like, but young people will still Google it and get the unvarnished truth. What they are finding is not attracting them. The initial and ongoing sacrifices pilots make are not worth the above-average income decades into their careers. Consequently, there are not nearly enough pilots coming to replace those leaving. The airline industry is vital to the economy, and it is about to hit a wall. The ensuing crisis will bring inevitable compromises in safety, and in further sacrifices by pilots. Automation is ready, is already being promoted as the solution to our growing problem. It just needs a good reason to be accepted, and we have created one. I would not want to be a beginning airline pilot today, their historically uncertain career has just gotten a lot less certain. I once flew with a flight attendant who explained to me why flight attendants should make the same as pilots. Her reasoning was that since the plane could not push back without flight attendants, they were just as vital to the operation as pilots and therefore should be paid as much. All they needed was better negotiators in her opinion. I hope you can see the flaws in her logic. It is the economics of the availability of workers in any profession that drives the core wage rate. Doctors will always make more than nurses for instance. Obviously there will be fluctuations about a core rate depending on a number of other variables. You make an excellent point about the lead times to create pilots, but this merely introduces a lag into the process. It takes time for an economic reality to enter into public consciousness. For years I'd hear the phrase "rich airline pilot". This image dates back decades due to things like the old Bob Newhart show and other perceptions. The reality has changed and the perception is also slowly changing after all the articles detailing the retail worker wages that entry level pilots can make at the commuter airlines. So yes, there is a lag, but when opportunity presents itself, observant and motivated young people making career choices will benefit. You make my point by pointing out that low wages have scared off many prospective pilots. My own son now at Usafa just turned down a pilot slot to go into spec ops (ouch!). Now there is a shortage and wages will have to rise to attract new entrants. I already see it in ads looking for pilots featuring paid crashpads and quick upgrades. United, without provocation, just gave their pilots a nice big boost and both Delta and United are toying with bringing their commuter operations in-house with the purchase of the C and E series jets. So the shortage will cause wages to eventually go up. This probably would have happened a decade ago if not for the disruption brought about by 9/11 and the recession of 2009. Re automation, the industry is absolutely doing all they can to speed the introduction of automation and there's little doubt that the future of the profession will be tightly linked to automation. But Boeing's latest generation of technology, the 787, still needs two pilots to fly. With a technology life cycle of about 15-20 years, I don't think we'll see single pilot airliners for at least a decade or two. I'll be happily retired by then. Take care. Your son may be wise to turn that down. After he finishes at the Academy he would have over two years of training events, then his ten-year commitment begins. He would be able to start a civilian flying career about when you say single-pilot airliners will be coming online. Many experts say much sooner, look at DARPA's ALIAS program, for instance. I currently work in two industries: aviation, and industrial automation. The changes happening in industrial automation are breathtaking, even frightening. Most people are blissfully unaware of how quickly we are moving toward a future we see in sci-fi movies and books. Which future, I don't know. Industrial machinery is not limited by ponderous rules of aviation and military specs, progress is driven hard by money, it is generations ahead of what is in operational military or civilian drones. It is a better barometer of what is possible and likely to come next and when. The 787 is certainly built for one pilot to fly. Your FO is there in case you die, not for convenience in reaching across the cockpit. It can take off and land without a pilot, although it isn't certified for auto takeoff. DARPA's ALIAS FO robots are specified for older airplanes, to give them the same abilities as newer planes, that is the point of that program. And of course, that means they are intended for use well before the end of the life cycle of our older airliners. Much sooner than 15-20 years. Back to your son, who would enter Embry-Riddle or UPT with an airline career in mind? By the time they enter the civilian career, it will be dramatically changed. They are looking at a 45+ year career, one that is most rewarding at the end, most challenging in the first decades. New pilots today are upgrading fast at the regionals, and senior regional pilots are flowing to the majors. Then more years of low pay and seniority until better pay finally arrives. Even in our accelerated career mode, it is still a long haul to good money, and the majors are working their pilots hard these days. I worry about their future. I don't have any special insight into exactly when we'll see single pilot airliners (or rather single operator as they won't really be pilots). I have little doubt that the technical prowess exists today for the operation of single pilot or even pilotless airliners. The challenge will be procedurally, regulatory, and probably of most importance socially. The public will have to be trained to accept single pilot airliners with the automated "assistant" as envisioned by DARPA. Unfortunately, consumer hardware and software has trained the average Joe to expect buggy products pushed to market before they're adequately tested. My iPad, the alleged sine qua non of our technological achievement (as far as average consumers are concerned) has to be reset with alarming regularity. These negative perceptions of technology will have to be overcome before anyone gets on a single pilot or pilotless airliner. It will happen, but the question is when. Hopefully we will avoid any more Asiana crashes where a gap exists between waning piloting skills and waxing automation. The public is already very familiar with drones, and cars with automatic braking, lane keeping and parking are slowly entering into the public consciousness. I suspect that the next vanguard will be cargo aircraft. I have little doubt that Fred Smith over at Fed Ex is chomping at the bit to fire half his pilots the second that he gets regulatory approval and the economics works. Yes, the piloting profession is in its twilight, I fear, which is why even though I am disappointed to see the boy not follow my (and his mother's) footsteps, it is probably for the best. He's already made his decision to walk away from aviation (and this was after soloing in the powered flight program at the Zoo).